Have you ever dreamed of waking up to the sound of horses whinnying and thundering hooves right outside your window? Well, in the Catskills Mountains of New York, you can do just that. 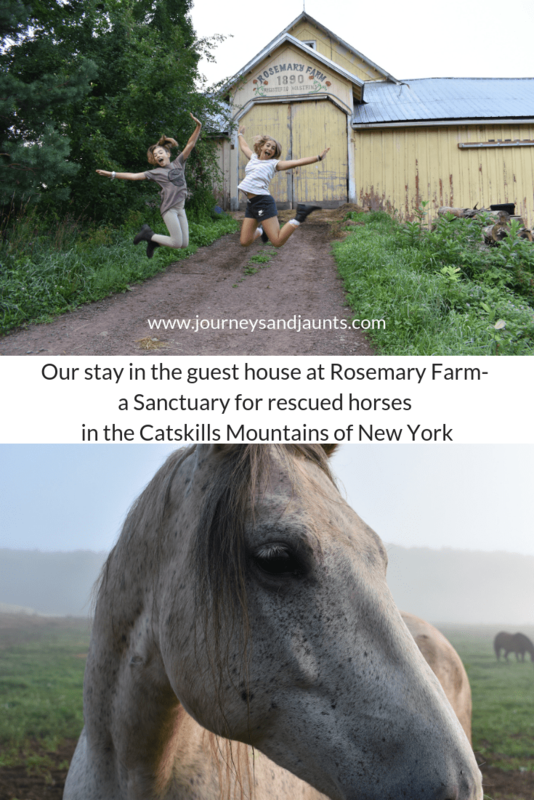 Rosemary Farm provides sanctuary to horses that have been starved, neglected and abused. Every one of their 84 residents has a story. Some were intercepted on their way to slaughter and picked up at auction. Others were confiscated by police. At the end of the day, if it were not for this sanctuary, they would no longer be with us… and due to the compassion of the sanctuary’s founder Dawn and her husband, these horses are living their best lives. I have never been to a place where horses get to be their true selves. They run in herds over 114 rolling acres of pristine land. They come in for food, but can sleep in the fields if they choose to do so. It is a place that does things very differently. I have so much respect for the work they do at this farm so when I heard that they opened a guest house, I was so excited to have the chance to stay there and really experience it. I brought my horse-loving nieces as well as my son. We stopped in the tiny village of Lee, MA to peruse a farmers market and another stop at Howe Caverns on the way. It was a long drive and we were so excited to arrive. The guest house is listed on Airbnb so it is very easy to book and the best part is that all of the proceeds go to support the work they do. The house has three bedrooms (two full-sized beds and one twin). The five of us were very comfortable. There is a full bathroom and kitchen supplied with basic cooking utensils. A basket of fresh eggs is delivered in the morning. My favorite part about staying in the guest house is that Stardust Meadows is in the backyard. A herd of 13 horses live there and I could watch them grazing from my bed. If you climb to the top of the hill, you will be rewarded with a breathtaking view of the entire valley. The house has no television or WIFI. I started panicking that the pre-teens would go stir crazy but we played games and actually talked! It was really nice to unplug. There was a record player and we listened to some old-school vinyl. It is a very rural area and there is not very much to do, but the farm had planned activities that we could participate in throughout our stay. We were given a full farm tour when we arrived so we could get our barings. The following morning, we met Dawn for farm chores. We mucked out stalls and filled nibble nets with hay. The girls helped with medications and even did some grooming. We met some of their famous residents such as Nemo, a donkey who arrived with a crushed leg. Normally any hoofstock with a broken limb is immediately euthanized. Not at Rosemary Farm. Nemo adoringly hooks his head on Dawn’s shoulder while she puts his prosthetic leg on in the morning and then he goes about his day as usual. It filled my heart with so much joy to see the children bonding with the horses. My son was chosen by the herd leader, Finn. This beautiful horse arrived at he sanctuary after being rescued at auction for just $5. Andrew took to Finn immediately and the feeling was mutual. Wherever Andrew went, Finn was a few steps behind. It was such a beautiful thing to see my child interacting with this big majestic animal, it actually brought tears to my eyes. His touch was so gentle it had a calming effect on the horse. I am so proud of the compassionate person he is turning into. The girls each fell for a horse as well. Sofia loved Molly and Marina bonded with Harper. The most magical experience I had was getting up before dawn one morning and hiking to the top of Stardust Meadows. The horses joined me and we watched the sunrise. It’s hard to put it into words without sounding hokey, but it was ethereal. A horse named River approached me. I put my hand out and he slowly sniffed me and let me touch him. I learned that he was a wild stallion who was caught during a government round-up and then sent off to auction. I could just picture River running wild with his long white mane. I can’t imagine the fear he felt or the trauma he went through from being herded by helicopters into a pen, losing his family and being shipped off like a piece of baggage, yet he was one of the lucky ones. It breaks my heart to think of the other wild horses that have had that energy snuffed out from being contained in a way that is so unnatural to them. On our last day, the kids had a lesson in natural horsemanship. It was really interesting to learn how to work with a horse through body movement rather than fear or intimidation. They used a bitless bridle and a soft saddle. It is such a great skill to learn to be comfortable around large animals. Rosemary Farm is a truly special place. If you love animals, you will love it here. Watching a herd of horses come down from the mountains and cross a river together is an amazing experience. Involving kids in a trip like this can teach them compassion and instill a love of animals in them. I also wanted to share a link to a National Geographic special of Behind the Shot that took place at Rosemary Farm. It gives you a really great glimpse at the property and is a nice introduction to many of their residents. To view the Airbnb listing for Rosemary Farm, just click here. Be sure to book through this link to save $40 off your first Airbnb stay. Not only will you be supporting their good work, but trips to animal sanctuaries are just plain good for the soul.